George Bernard Shaw said that “Lack of money is the root of all evil.” And some other people said that “The Love of money is the root of all evil.” To my point of view, it solely depends on how you are handling this creature called “Money”. No matter what they said, it is apparently true that we cannot survive without money. Most of us are using our own time, energy, and efforts to be able to get money for our lives. Why are we blaming money for not being able to achieve it for the amount we want? It does not depend on money, but on you and me how we treat money. Are we treating it as a partner or are we treating as an enemy, it is all up to you. As I told you in few previous posts, the year 2010 could be named as a year of Audio books for me as of I have listened a lot of Audio books in this year. Most of those books I listened also shared on my pages for all of my friends to be able to listen too. 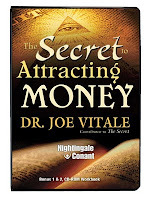 This time, a book I would like to share is called “The Secret To Attracting Money”. Sounds interesting, right? A lot of people are curious about that are there the secrets for attracting money? Basically, no one will believe it. If there it is, it can be learned. But the truth is that not believing that money can be attracted is one of the biggest obstacles that preventing money to come into our lives. Avoid the lies, myths, and media conspiracies that will keep you in a state of "victim-hood" and "poverty consciousness"